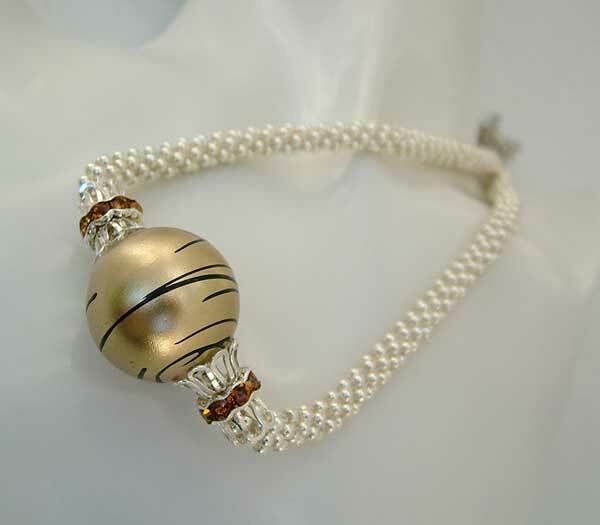 This crochet beaded necklace - "Golden Ball II" is upon the request, after someone had seen my "Golden Ball" - which is very similar but not identical. I think that is because I find it very hard indeed to make exact duplicates of the same thing. My boredom threshold is very low indeed. Because of the similarity, I think I will not be putting a lot of work notes to this piece. 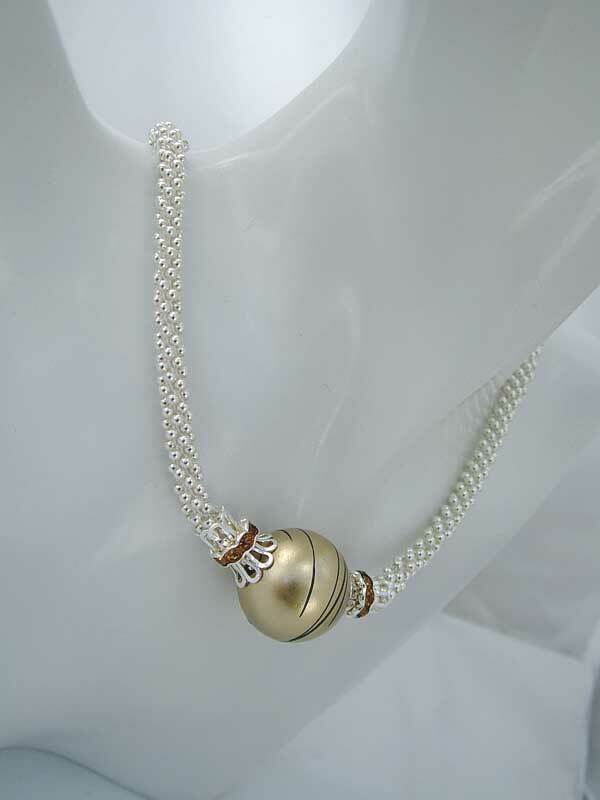 Most of the working techniques or short notes can be found in Golden Ball beaded necklace. 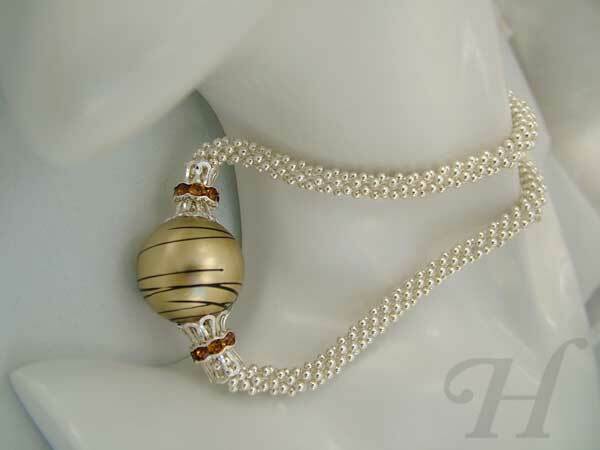 So instead, I am including a lot of photos which by their details, will usually give you a good idea as to the construct of this crocheted beaded necklace. Just click on the smaller photos to view the full details. These photos will give you a better idea into the construct and work details of the piece. 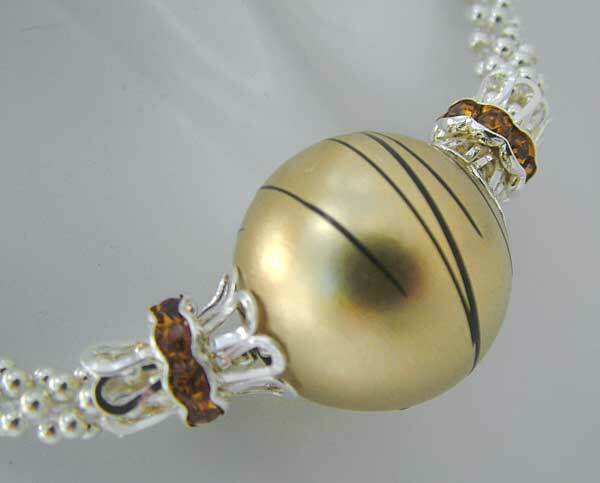 As with the originalGolden Ball necklace, the "Golden Ball" here for this beaded necklace is a lovely big bead made from a modern form of acrylic called Fantastic Acrylic. The new material can take on amazing metallic colors and it is still light enough to not wear the person down with weight. 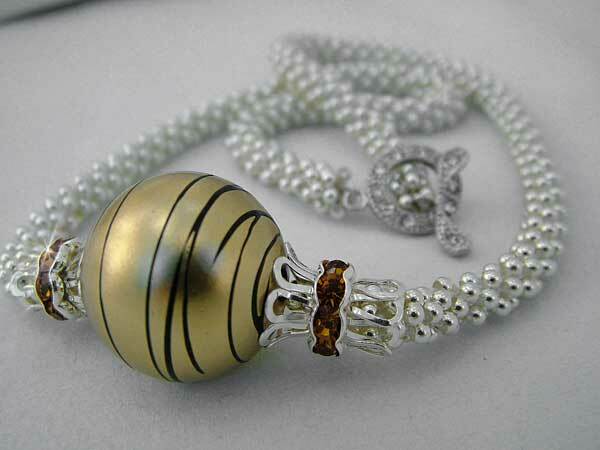 And this time round, I have used a similar fancy-frilled spacer, but with matching topaz crystals. I have hardly any of these fabulous spacers left. They are ideal for this particular design. One one side, it allows me to squish the "frills" to exactly cup the end of the beaded crochet rope. And at its other end, it allows me to better shape and fit it's "frills" against the large circular "golden ball". 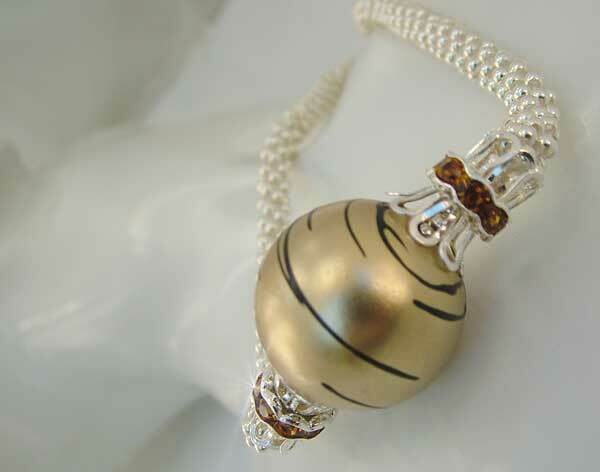 Though it does not show in the photos, the "golden ball" bead has a pretty large hole. When thread which is much smaller than the bead hole is left as it, there is much more wear from friction which the thread has to endure over time. The crochet rope here is made in 2 sections. The crochet rope itself does not go through the bead hole: it is too thick for that. The thread from each rope section goes through the bead, is tightened appropriately and is woven-secured in the body of the rope on the other side. 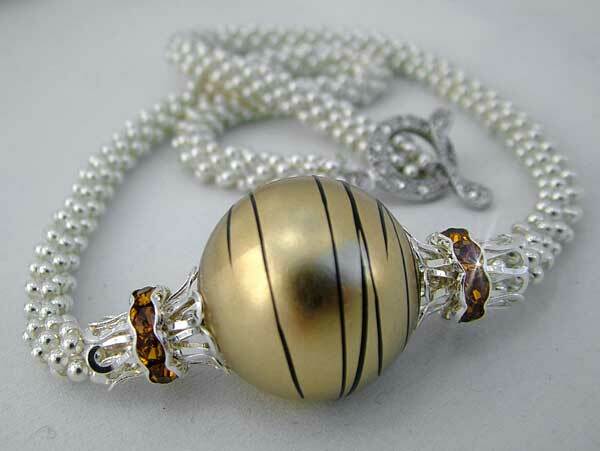 Here because the hole of the focal bead is so large, I was able to thread a string of the seamless metal beads, running all the way through the entire bead hole. The thread from both sections of the rope runs through this length of hidden strung beads. This ensures a much more seamless look to the whole piece and even more importantly, provides the threads (that run through the focal bead) great protection against friction wear. In this next close-up photo, you can just get a glimpse of the "hidden" strung beads I was talking about. 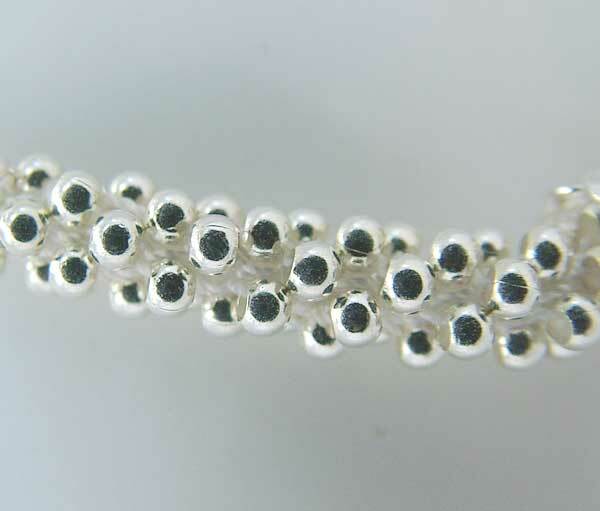 This is a close-up of a section of the beaded crochet rope. If nothing else, it shows you how perfectly a beaded crochet rope can "absorb" the crochet thread used, so that it is virtually invisible. Last but not least, is the clasp. 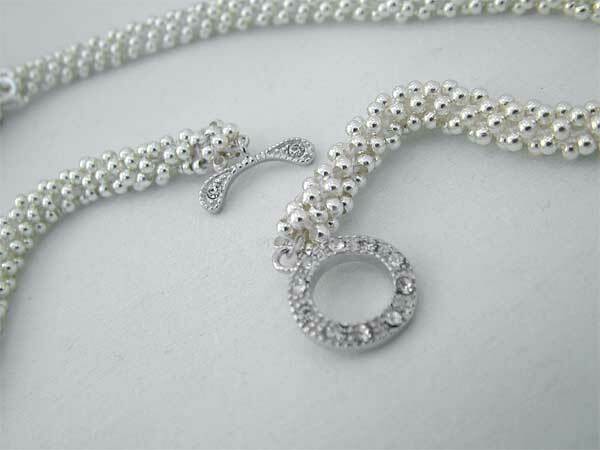 Here I chose to use a toggle clasp with tiny crystals. The choice of closures is always a little bit of a hassle for me but that is more due to the fact that I am impatient to move on to the next idea or project. However I must say that with beaded crochet ropes, the endings and the suitable clasps for it is an extra bit of bother. The ends of a beaded crochet rope can look unfinished and uneven. One always has to pay it a bit more attention and be a bit more creative when it comes to finishing off a beaded crochet rope. 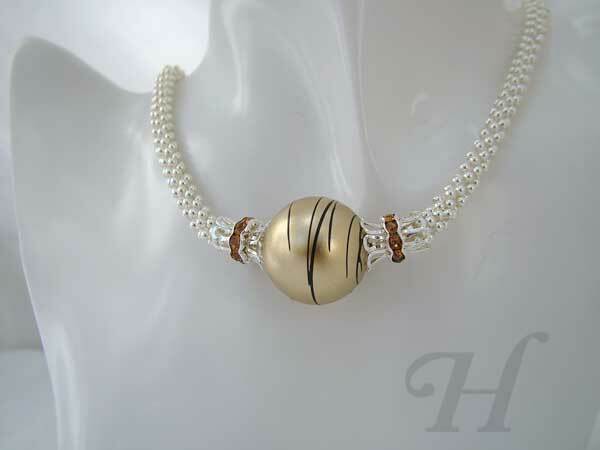 I am pleased to say that here, the clasp and finishing looks pretty good. I used wire guards at both ends. Via this enlarged photo, you can even see a bit of the crochet thread through the wire guard. IRL (in real life), that is almost imperceptible. The wire guard allows both a solid finish, and a means of protecting the thread from friction wear. And it enables a solid, closed connection joining the crochet rope and the closed loops on the toggle themselves. What is not obvious is that I left quite a bit of crochet thread - both at the start and at the end. You never know when you will be grateful for this extra leeway. In this case I was. After the wire guards and the toggles were attached, at each end, using the extra crochet thread I had, I sewed in additional beads so that not only do those additional beads cover most of the wire guard, but they evened out the ending of the crochet rope seamlessly - giving the crochet beaded neckalce a much more polished finish.